When it comes to building muscle mass for hockey athletes, you need to have an adequate intake of protein in your diet. Technically, water makes up roughly 75% of your muscles weight, it is the protein component of your muscle that is responsible for carrying out your skating, shooting, hitting, and general athletic movement. Naturally, when synthesis exceeds breakdown, we have a lean muscle mass growing athlete. In opposition to what most people think, you don’t build muscle tissue while you train. In fact, the exact opposite occurs. Muscle tissue is breaking down at a very high rate during training and protein synthesis is dramatically suppressed. Although this sounds weird, this is what’s required in order for us hockey athletes to build muscle tissue. It’s similar to the old saying “what doesn’t kill you makes you stronger” type of analogy. What we do in the gym is stimulate muscle growth, as opposed to actually grow muscle tissue right there on the spot. When we train hard within the correct volume/intensity/frequency recommendations in order to promote muscle growth, this is simply creating the stimulus for growth. Where the real muscle building takes place is after exercise. During this time, your synthesis rates fly up through the roof and your breakdown rates come down to almost nothing. And, depending on how hard you trained, your synthetic rates can remain elevated for 24-72 hours or more within the muscle group that you trained post-exercise. For example, if you hit your legs hard today, that means you can be adding dietary proteins to your leg muscles for the purpose of building muscle mass for up to three days after that workout. It’s during this recovery period where you’re actually growing. What’s funny to me is so many people take their training seriously, but completely drop the ball when it comes to their sleep and nutrition habits. Because training was only the stimulus, your nutrition and sleep are going to determine whether or not you actually adapt to that stimulus to build muscle tissue. Let me tell you something, synthetic rates don’t mean anything if your sleep and nutrition aren’t optimal. In fact, that’s the #1 reason why people always look the same every year, too much emphasis on training and not enough emphasis on nutrition and sleep. But, beyond the adaptation component, the processes to stimulate muscle growth within the gym are incredibly complex and not completely understood yet within the scientific literature. Muscle tension is widely considered the most important factor in training for muscle development. The extreme tension pulling on your muscles from lifting weights knocks your muscles out of homeostasis, and kicks off a fancy process called mechanotransduction. Mechanotransduction is a fascinating process where the simple tension on a muscle cell creates a chemical secretion inside the to turn on anabolic (muscle building) pathways. Muscle damage is pretty straightforward. If you have ever done a good leg day, what you’re feeling is Delayed Onset Muscle Soreness (DOMS). Soreness typically initiates within 24 hours after training, and reaches its worst state 48 hours after training. This muscle damage creates microtears/microtrauma in your muscle cells which signals the immune system to come help clean up the debris and build more muscle tissue so you’re stronger next time. Uniquely, your body also strengthens that particular muscle’s ability to withstand future damage – adaptation! Metabolic stress is probably the most fun muscle signaling process you can do, it’s my favorite at least. Research demonstrates that large amounts of metabolic stress within the muscle (lactate, hydrogen ions, large volumes of blood, etc) can set off its own independent signaling cascade for enhanced muscle growth, enhanced oxygen delivery, and improved nutrient delivery to the muscle cell. How do we do this? Get a pump! The excess water and cell swelling exerts pressure on the walls of your muscle. In turn, the muscle perceives this as a threat to its structure and sends signals to the body that it needs to get bigger. So, what are some of the main takeaways here? 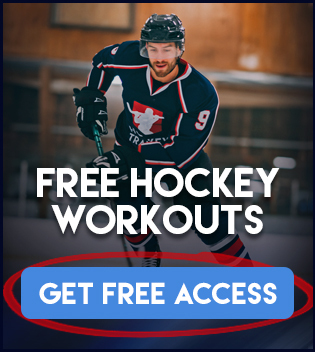 Well, there are three primary ways in which we can optimize muscle growth as hockey players during the season or offseason. And for best results, it’s best if we use some combination of all the above. High reps for metabolic stress. Controlling the eccentric portion of your lifts for some damage. And using heavy weights during training to create maximal tension. Only by using a combination of these factors can you optimize your training. Put another way, if you train the same all the time, you’re likely getting 1/3rd of the results.